Continuing on the Halloween theme bento. I chose to make a black cat for today's bento. I was supposed to make a spider web from nori but my migraine hit me again this morning. So I just gave up with the nori spider web cutting and just put a picture of spider web instead. I didn't get online yesterday, so I will have to catch up with everyone's blog post and tweets. I brought Audrey to the hospital yesterday afternoon and met her doctor. We saw the X-Ray and the broken bones has joined up. Thanks God! The cast has been opened too yesterday. Now, she only wears a thin hand band for another 3 weeks. Hope the bones will heal up and join up perfectly! Inside the box : rice, pan fried fish, stir fried snow peas & sweet pepper, half of cherry tomato, and tamagoyaki. The brown color tamagoyaki was made by adding dark soy sauce and salt and mixed together with egg. Cute kitty! So sorry you weren't feeling well. Hope you can rest a bit and recover. Glad to hear about A's arm. Great thing about kids is how quickly they heal. Nice cat, love it's eyes. Take more rest & hope you are well now. Oh, good to know that your girl is recovering so fast. Kids can heal faster than us..hehe. @ prince n princess mum : Thanks a lot! Despite having "scary eyes" but the kitty still look cute. :) And so happy to hear the recovery of your daughter's arm. You take care too ya. So cute!! I love the detail on the cucumbers. Did you cut that by hand? Nice to hear A ´s bones are healing nicely.. I hope you will feel better soon too. Migraine is really bad, resting and being away from light is the thing to do. Lovely. How did you do the 'ribbed' tomagoyaki ? Nice. Super awesome! Love the little touches like the hat the cat is wearing. hehe. So glad to hear Audrey's cast came off and her bones are healing well. Yay! Hope you're feeling better now Lia.. migraines are horrible. What a cute Halloween kitty! Hope your migraine goes away soon. It's good to hear that Audrey's broken bones are healing well. So darn cute I can hardly stand it! Love it. @Fuji Mama : Thanks a lot Rachael for your sweet comment! Great news about Audrey, but I feel sorry for your migraine, hope you'll be much better soon. 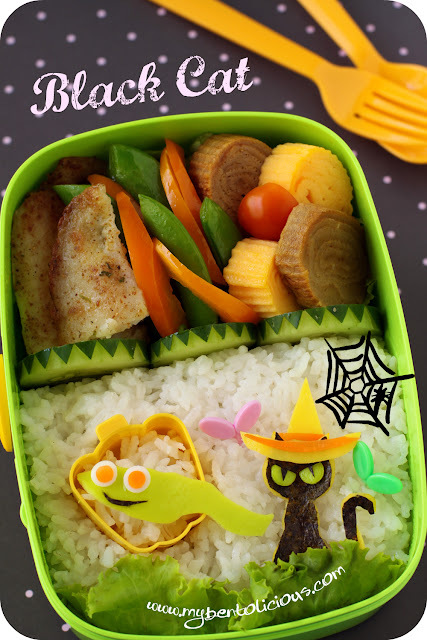 Cute cat Halloween bento!! It amazes me even in such condition you still still can make great bento!! The cat in the hat! Haha...Love the eyes so much! @Just a MOM : Thanks a lot Lin for your kind attention and comment! Love the black cat bento, I so need to get one out for Halloween! The whole bento looks so good. Good to hear about Audrey's healing bones! I'll bet she's thrilled!